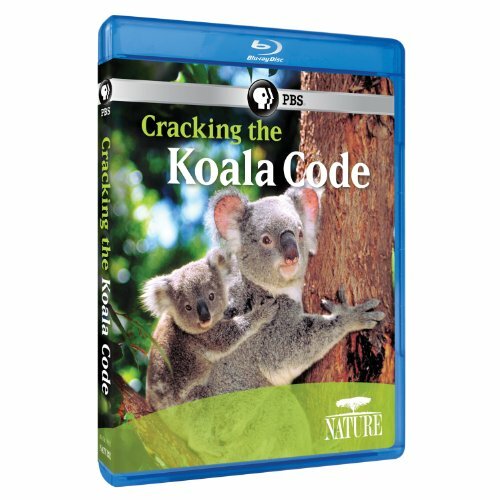 Arlington, Va. - June 15, 2012 - PBS Distribution today announced it is releasing Nature: Cracking the Koala Code on DVD and Blu-ray. Loud bellows ring out from a small pocket of forest surrounded by dense suburbs and busy roads in Brisbane, Australia. It's mating season for koalas. Their thunderous roars are difficult to reconcile with the familiar perception of them as cuddly creatures. But it turns out their world is in fact far from cute and cuddly. Rather it is filled with social pressure, conflict, disease, overcrowding and the external stresses of living in the middle of what amounts to an alien world. Predominantly slow-moving, energy-conserving koalas are not exactly well-equipped to handle speeding traffic and packs of dogs, or the consequences of encroaching urbanization. For a real change of pace, NATURE enters the world of urban koalas trying to adapt to life in the fast lane. The DVD and Blu-ray release of this program will be on July 24, 2012. The program has a run time of 60 minutes. The DVD has an SRP of $19.99 and the Blu-ray has an SRP of $24.99. The film explores the day-to-day dramas of an extended family of koalas, seen through the eyes of the scientists studying their every move and vocalization. Fascinating social dynamics include territorial displays, vicious fighting and the surprising life and loves of a "traveling salesman," a rogue male who truly plays the field. New science even "cracks the koala communication code," providing insights into their basic language and social structure. "People love koalas, yet there is a great deal about them they would find surprising," said Fred Kaufman, series executive producer and recently named recipient of International Wildlife Film Festival's Lifetime Achievement Award. "Koalas may seem docile and sweet, but they are really quite active and can be very aggressive and loud. Viewers will get a whole new perspective after watching this film." Meet Mary, a typical suburban koala mom. While human life zooms around her, she remains still for hours on end, sleeping or resting 80 percent of each day. Like all mothers, her priority is her young joey as he grows and learns the ins and outs of his new world. She will protect her six-month-old joey, Bruce, until he is weaned. To keep up her strength, she snacks on toxic gum leaves, a diet lethal to most other mammals. But to process the nutrients in the leaves, she must chew the leaves for long periods of time before digesting them for more than 100 hours. Hendrix, the dominant male in the territory, claims Mary as his own and is always trying to mate with her and the other females in his group. He is often challenged by James, a subordinate male, who is always looking for his chance. To show he's boss, Hendrix scent marks trees, a sign of territorial display, and vigorously defends his females when necessary. More than a thousand miles away on St. Bees Island, biologists Dr. Bill Ellis and Sean Fitzgibbon are engaged in ground-breaking science sponsored by the San Diego Zoo. Using 3G solar-powered mobile phones to record koala vocalizations, and applying their recordings in the field to evoke koala responses, they have managed to decipher some of the koalas' communications. Remarkably, the females may be able to tell the physical well-being of potential mates simply by the tone of the males' grunts and bellows. They also observed that dominant male koalas express "ownership" of individual home ranges nearly 2.5 acres in size. Through DNA analysis, the team made a most surprising discovery - that rogue males sometimes travel between colonies to mate with females and in the process sire about 40 percent of the offspring in a group. Back in the suburban forest area ruled by Hendrix, a wandering male called Mustafa eyes Mary. A fight ensues, which Hendrix wins, but Mustafa returns two months later and secretly mates with Mary behind Hendrix's back. And James, too, is still waiting for his chance. Once Bruce has grown, he and his mother Mary part company and set off on their separate paths through the surrounding suburbs. As the patchwork of their forest territories shrinks, they will face mounting numbers of challenges and will need the help of science and conservation to find their way to a safe future. Celebrating its 30th season, NATURE is a production of THIRTEEN in association with WNET, the parent company of THIRTEEN and WLIW21, New York's public television stations and operator of NJTV. For nearly 50 years, WNET has been producing and broadcasting national and local documentaries and other programs for the New York community. NATURE is a production of THIRTEEN in association with WNET for PBS. Fred Kaufman is executive producer. "CRACKING THE KOALA CODE" is a production of Wild Fury Pty., Mindful Media Pty. Ltd., and THIRTEEN in association with WNET. Celebrating its 30th season, Nature is a production of THIRTEEN in association with WNET for PBS. Fred Kaufman is executive producer. Nature pioneered a television genre that is now widely emulated in the broadcast industry. The series has been consistently among the most-watched primetime series on public television. Nature has won more than 600 honors from the television industry, the international wildlife film communities, and environmental organizations including 10 Emmys, three Peabodys and the first award given to a television program by the Sierra Club. In October 2010, the series won the Christopher Parsons Outstanding Achievement Award, one of the wildlife film industry's highest honors. Major corporate support for Nature is provided by Canon U.S.A., Inc. Additional support is provided by the Lillian Goldman Charitable Trust, Filomen M. D'Agostino Foundation, Susan Malloy and the Sun Hill Foundation, the Corporation for Public Broadcasting, and the nation's public television stations. For more information, visit pbs.org/nature. New York's WNET is America's flagship public media outlet, bringing quality arts, education and public affairs programming to over 5 million viewers each week. The parent company of public television stations THIRTEEN and WLIW21 and operator of NJTV, WNET produces and presents such acclaimed PBS series as Nature, Great Performances, American Masters, Need to Know, Charlie Roseand a range of documentaries, children's programs, and local news and cultural offerings available on air and online. Pioneers in educational programming, WNET has created such groundbreaking series as Get the Math, Noah Comprende and Cyberchase and provides tools for educators that bring compelling content to life in the classroom and at home. WNET highlights the tri-state's unique culture and diverse communities through NYC-ARTS, Reel 13, NJ Today and the new online newsmagazine MetroFocus.